Ray successfully achieved his Level 3 VCQ and VRQ in Light Vehicle Maintenance and Repairs at Team Hard Racing earlier this year after progressing on from his previous apprenticeship at Level 2 in VCQ and VRQ in Light Vehicle Repairs. We caught up with Ray to see how his Apprenticeship is helping him since he achieved and he is doing very well! Courtesy of Ray’s hard work throughout his time on his apprenticeship; he has continued his employment with Team Hard and has been promoted to management, and now oversees the Workshop and encourages and supports other apprentices within the company. “When I left school, I went to college to do Carpentry and became fully qualified, but I didn’t enjoy it and wanted to try something new, and have always had an interest in cars. I have always been aware of apprenticeships and when I joined Team Hard myself and my boss looked together, and as IPS was local to us it went from there and I completed my Level 2. After finishing, I left Team Hard but then came back and did my Level 3 again with IPS, as we chose them due to the support I received on my Level 2. At level 2 you are not deemed fully qualified and I wanted to be fully trained so Level 3 was always something I wanted to do. Mechanics is a big field to learn in and I believe you never stop learning, I still learn every day. Since completing Level 2 and 3 Ray has now become the workshop manager at the Garage and believes that doing his apprenticeship now helps him relate to their other apprentices they have at Team Hard. “The person who supported me as my mentor at Team Hard, was a manager who left over a year ago, so I stepped into the managerial role that he left of which happened quite naturally. I feel like I have worked hard to progress and I enjoy my managerial responsibilities, I still work on the cars every day, but I now have more responsibility with deadlines. We have gone on to take more apprentices, and I feel I have a good relationship with them and can relate to their training as I always know where they are with progression of their apprenticeships and know what they are expected to do. I think it helps them as well as they can see my progression and what can be achieved. I can relate to them and they can relate to me due to being in their shoes and respecting them. I try to pass on the knowledge I have, for example, when working on gearboxes and engines which they haven’t experienced yet, I get them to watch and get involved with my supervision. Ray believes apprenticeships do not just benefit you but also the company too. “Both of my apprenticeships have helped me positively. When I completed carpentry at college, I left and it felt like there was a big world out there and I was almost intimidated in some ways to go to a building site and not have that experience of being on site. We can see the apprenticeship has helped Ray as he has progressed to a managerial position at team hard, but Ray would still like to progress and talks about how his IPS trainer has spoken to him about his future and guided him about further education. IPS would like to congratulate Ray; after completing his Level 3 Apprenticeship, Ray has been working in full-time employment and has progressed to managing the workshop. 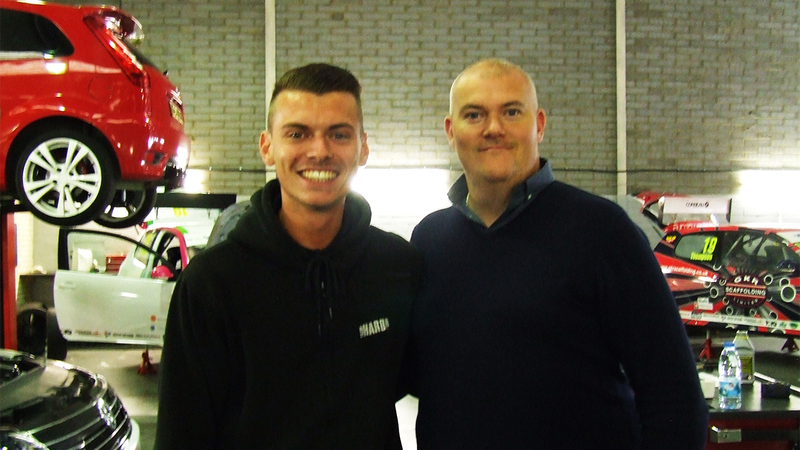 We wish him every success in the future and hope he considers his Master Technicians qualification with us. All the best Ray!